There could be many reasons why a computer slows down or frequently crashes and freezes. Some reasons are because the computer is old and not updated, and sometimes it is merely because of the owner’s inability to take care of the computer system. The computer system may slow down because of one reason, or combinations of the reasons that are given below. The most common reason why the computer becomes slow is because the computer has infected with viruses and malwares. Viruses, like Trojans, infect the computer system directly which causes the frequent crashes. Computer tends to get infected when the user unknowingly opens malicious emails and views attachments that contain viruses. The computer could also get infected by just clicking IM links, downloading applications and programs, or even by just going to or viewing unprotected/malicious websites. Spywares and malwares can also slow the computer because whenever it is executed, it collects too many information that bulks up and tends to collect more memory space, thus getting a sluggish computer. On the other hand, these problems can be solved through Antivirus or running an Internet Security and Spyware scan. If the viruses had become so serious, reinstalling Windows might be the only solution to it. Too many programs that run at the same time during startup could also delay or slow down the performance of the computer. If the user downloads or installs more applications that run during startup, it causes slowness of the system. Sometimes, there are programs running simultaneously even without the knowledge of the computer user and tends to take more memory usage. However, these problems could be managed. By closing all the programs that are not necessary and managing properly the startup programs could help the computer system perform at its best. To stop programs and applications from running during startup, go to START> RUN>type msconfig> click Startup tab>uncheck any programs in the list that doesn’t need to start automatically. The Windows Registry is the control center of the Operating System and Programs installed in the computer. It is where important information from programs and applications are stored for various purposes. However, if the registry becomes corrupted or bloated, this causes registry errors and will affect the speed of the computer system. This might also cause application to run during startup, crashes, freezing, and even general disruption of the system. Users are warned not to make any changes in the registry. It is more recommended to use a registry cleaner for safer use, or do a system restore after backing up the Windows Registry. The computer needs certain amount of space to be able to operate properly. The bigger the space usage, the slower the computer becomes. Too much space used in the hard drive could cause slow computer performance. It is recommended to delete unnecessary files in the hard drive such as temporary files and remnants from deleted programs to free more space in the hard drive. It is also suggested to perform disk cleanup frequently for a healthy hard drive and prevent overloading. As the user loads or deletes information from any programs in the computer, files becomes fragmented. Files scatters over the hard drive and searching for files needed by the program to run may cause the computer to slow down. As the user tends to add up more information to the hard drive, files becomes fragmented. The problem can be solved by doing a Defrag once a month. To be able to run the Window’s hard drive defragmenter, go to Start, select All Programs then select Accessories, select System Tools and then click Disk Defragmenter. A new window will appear and choose a hard drive that is intended to be defragged. The computer needs a storage medium for the programs and applications; this is where the RAM comes in. The RAM or Random-access memory is the place where important information from the operating system, application programs, and data in current use are reserved for the CPU to access it quickly. The computer normally has 256 MB of RAM capacity. These memories are used whenever programs are installed or executed in the system, and if the program that runs in the computer goes beyond the memory capacity of the RAM, the tendency is that the computer will begin to use the hard disk drive for memory use. This means that the RAM does not have enough memory to do its job properly and causes the computer to become slow. The solution is to free more space on the computer file system. Uninstall or delete unnecessary programs and stop any unnecessary application programs to automatically run during startup. It is also recommended, for those computers designed to allow it, to add additional RAM modules to the computer up to a certain limit. Always make sure to leave a little free space on the computer’s file system. There is some antivirus software that uses a lot of memory space to be able to do its job properly; however, this causes the computer to slow down. Having an Internet Security/Antivirus programs is a need, and it needs also to keep on running to detect malicious files and protect the computer. On the other hand, these programs takes too much of the memory that it takes for other programs to run or load. That is why, it is recommended to have antivirus software that only needs low resources or free more space in the system to be able to back up the software’s need of memory. The speed of the computer system usually depends on the power of the CPU or the Central Processing Unit. Since it is like the brain of the computer, if it doesn’t think fast then it doesn’t work fast too. Since CPUs are not usually upgraded, it is suggested to buy a fast and most robust CPU to cope up with the demands of the programs made today. Of course, a cheap CPU is a slow CPU. On the other hand, old versions of Operating system are slow. It is recommended to install the most current version of Windows to cope up with the demands. A corrupt OS can also be fixed by reinstalling it, but make sure to back up the hard disk to prevent any problems. The reason why computer slows down is merely because of the computer user himself. These problems, however, can be fixed by software automatically in just one click. 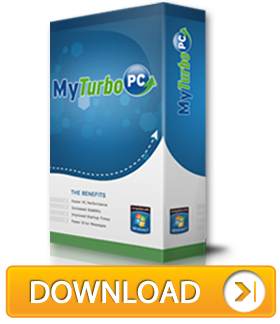 MyTurboPC is created to address issues and problems related to computer speed. It is easier to fix the problem with this software rather than fixing it manually. Purchasing the software is not really costly, but it is worth a try and a buy.